Last Christmas... someone gave Brett that jumper. Brett Domino and TC-Helicon's VoiceLive Touch always sounded like a match made in heaven. The YouTube star has been busy cracking the UK singles chart recently, but when we asked him to take TC's new touch-operated vocal harmony, effects and looping box for a spin he was happy to oblige. Of course, the best way to test a product like this is to see how effective it is in a music-making context and, it being (almost) Christmas, we asked Brett to put a festive spin on things. 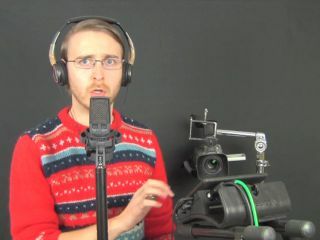 As usual, he came up with the goods, delivering a unique take on Wham's Last Christmas while wearing a jumper that's as seasonal as they come. The TC-Helicon VoiceLive Touch costs £415 and is available now. If you're looking for more Brett Domino-related yuletide fun, go and watch the video for his sublime Hello Mistletoe (Goodbye Cold Snow) and then buy the song on iTunes.